I’ve always been a big fan of polenta, but with how miserably cold it’s been this winter, I’m turning into a complete fiend. I think I could eat polenta morning, noon, and night until the day comes (probably sometime in late May) when I can step out my front door without seeing my breath and wearing fewer than 10 layers of clothing. 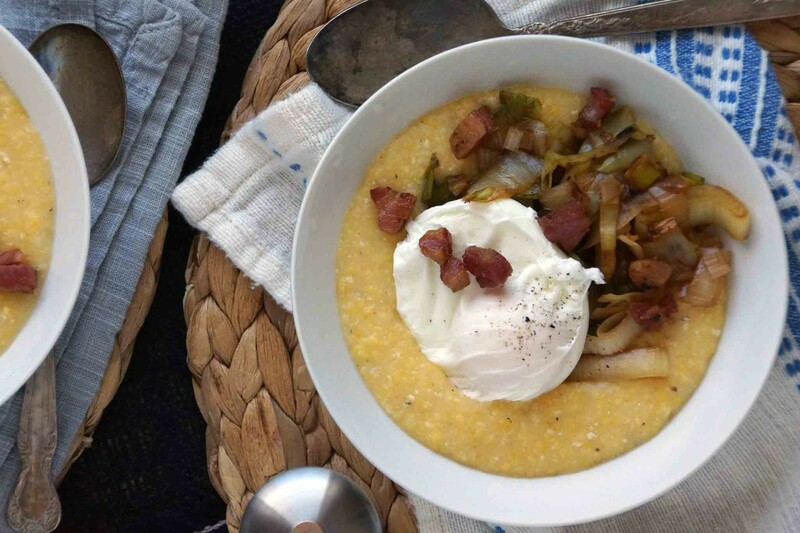 My latest go-around was a bowl of very creamy polenta topped with sautéed leeks and endive, crispy pancetta, and a runny poached egg. 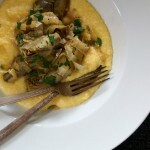 It makes an excellent stick-to-your-ribs sort of breakfast, a great just-came-in-from-shoveling lunch, or an excellent I’m-going-to-find-comfort-in-this-warm-bowl-of-polenta-while-I-sit-on-the-couch-wrapped-in-an-afgan-bemoaning-the-fact-that-I-live-this-freaking-tundra dinner. Right. 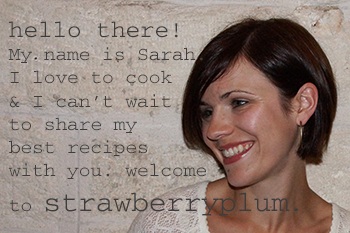 But enough about the weather, let’s make something to eat! 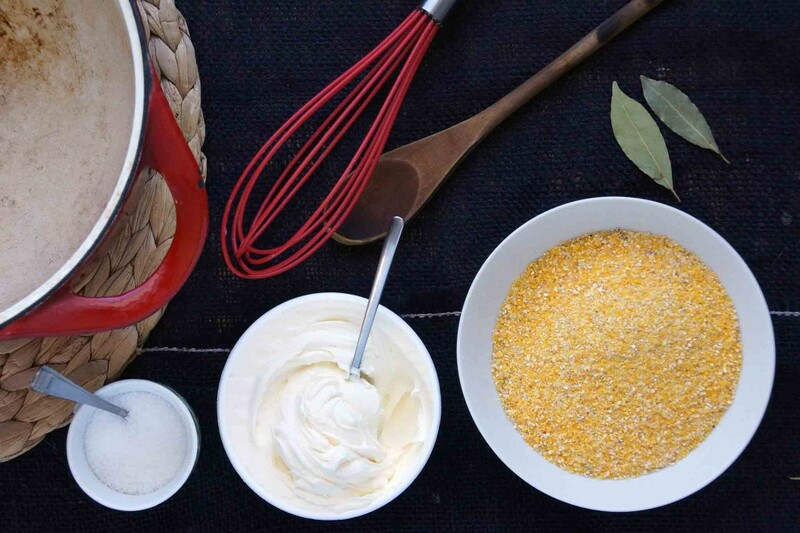 Get the polenta going first, then we’ll tackle the toppings. Bring a pot of water to boil and slowly whisk in the polenta. I usually use coarsely ground polenta and cook it in salted water with a couple of bay leaves. If you want to up the flavor, use chicken or vegetable stock. I love to add a few dollops of mascarpone at the end to make it extra creamy, otherwise some grated parmesan is good too. Now we’ll deal with the toppings. 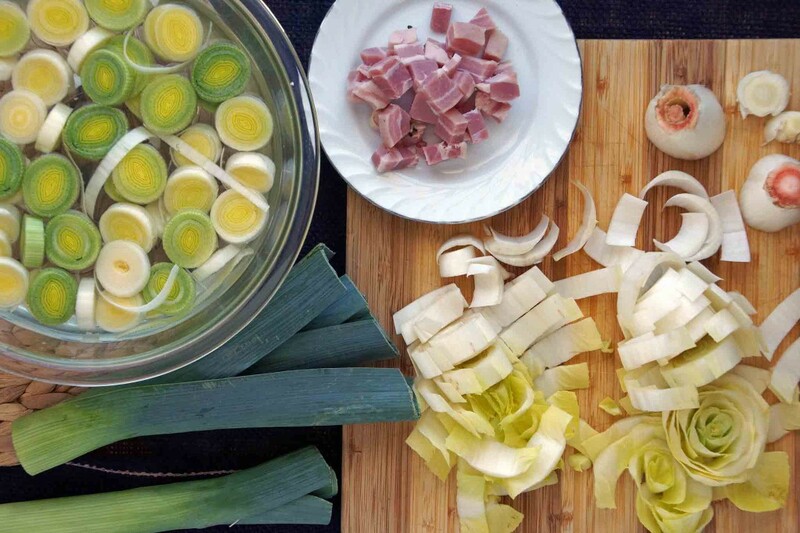 Dice a thick slice of pancetta into cubes, cut leeks into rings, and roughly chop Belgian endive leaves. Toss the pancetta in a pan and crisp it up. Take it out and saute the leeks in the fat from the pancetta. Let them cook for a few minutes until their sharp oniony flavor mellows and is almost sweet. Add the endive and sauté for a few more minutes. Poach a couple of eggs and put it all together. Assume your position under your favorite blankie and make try to make the most of what I’ve dubbed the winter that may never end. 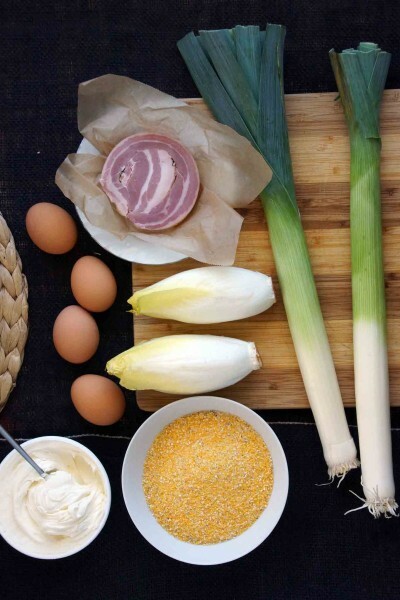 Creamy mascarpone polenta is topped with sautéed leeks, endive, crispy pancetta, and a poached egg for a dish that couldn't be more comforting on a frigidly cold winter day. First, start the polenta. Bring the water or stock to a boil with the bay leaves and salt. Slowly pour in the polenta while whisking. Reduce the heat so the mixture is gently bubbling. 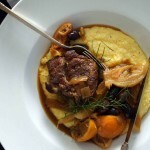 Cook, stirring often, until the polenta is smooth and creamy, 30-45 minutes. If it starts to feel too dry, splash in a little more water and stir quickly to incorporate. When it's done cooking, take it off the heat and stir in the mascarpone. Taste and season, as needed. Meanwhile, prepare the toppings. 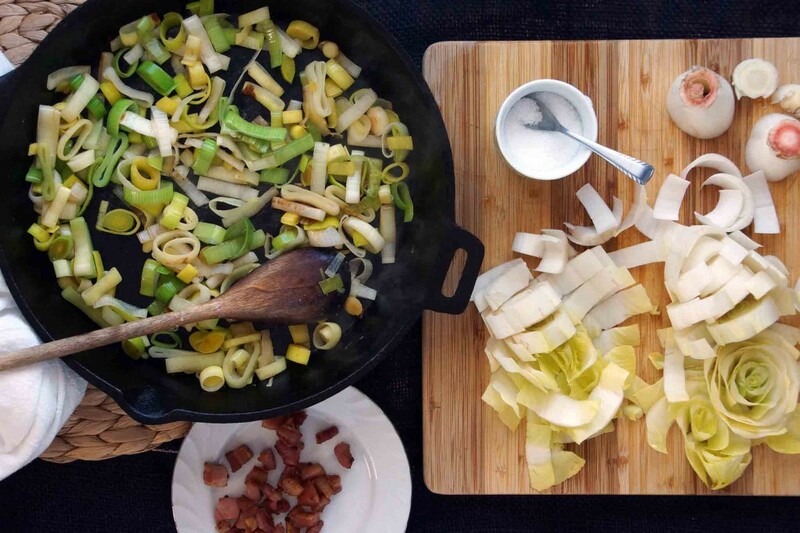 Sauté the pancetta in a large skillet until it's crisp, about 5 minutes. Remove from the pan and add the sliced leeks. Sauté over medium-high heat until they've wilted and caramelized in spots, about 5 minutes. Add the chopped endive, season with a pinch of salt, and sauté until wilted, about 5 minutes. Add the pancetta back to the pan and allow it to reheat for a moment. 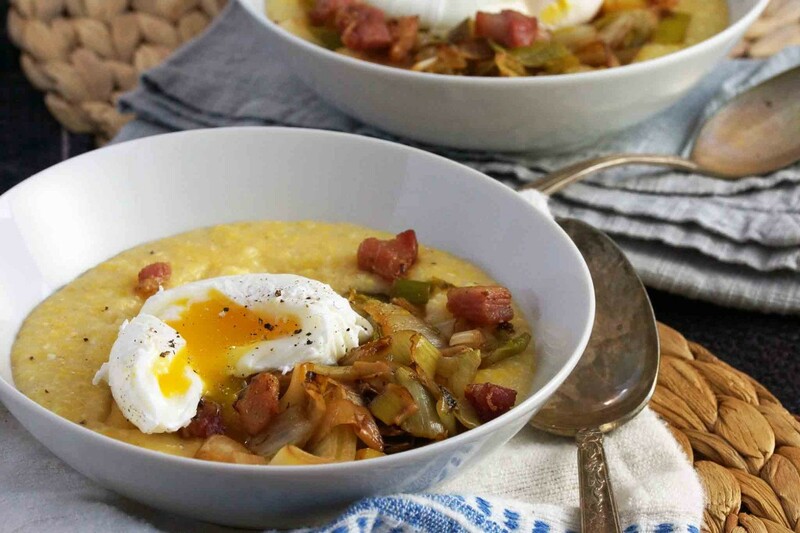 While you've got the endive sautéing, poach the eggs. Bring a large, deep skillet or saucepan of water with a splash of vinegar to a simmer. Crack each egg into a coffee cup or small bowl and gently lower into the simmering water. Cover the pan, turn off the heat, and allow to poach for 4-5 minutes. Remove the eggs with a slotted spoon and allow them to drain on a paper towel for a moment. Divide the polenta between warm bowls. 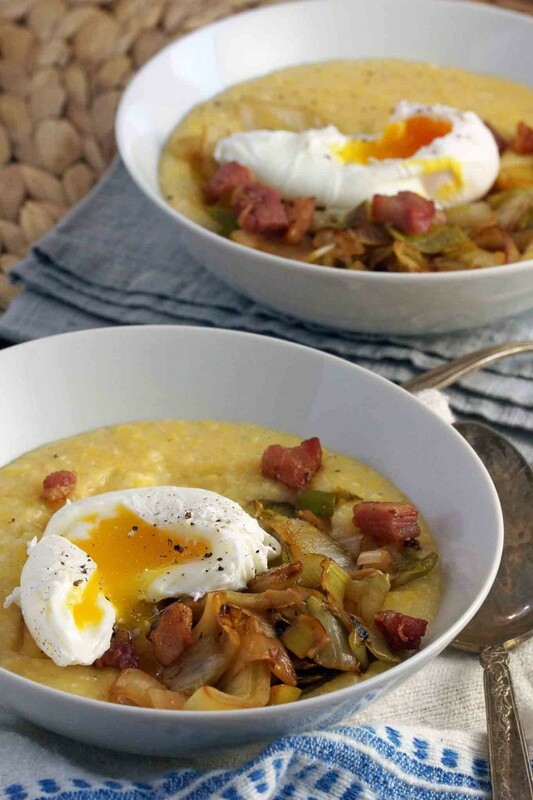 Spoon the sautéed vegetables and pancetta over the polenta and top each bowl with a poached egg.